Our calibrated testing equipment is company owned and all work is self-performed by our certified Building Enclosure Specialists. TMI® is a member of the American Society of Testing and Materials (ASTM), the Untied States Green Building Council (USGBC), the Air Barrier Association of America (ABAA), and the International Association of Certified Thermographers (IACT). The principals of TMI® have been involved in the construction industry since 1982 as land developers, as builders of residential and commercial properties, and as early adapters of air barrier materials and methods. Our past experience comes from hands-on construction project management, as principals. We have walked the walk. From design drawings and specifications, through contract documents, subcontracted trades-coordination and sequencing, inspections, punch out and completion on-time on-budget, with little to no warranty issues. We have lived and understand the process better than those who have merely sat in classes or behind a desk. In 2007 TMI® was formed to assist building owners reduce energy costs, consumption, and sustain the life of buildings. What started out as an infrared inspection firm specializing in diagnosing moisture and air infiltration quickly grew into a building enclosure and consulting firm. Our years of experience, knowledge and understanding of the construction process, trades, air barrier materials, and thermal and moisture protection sets us apart from our competitors. TMI® Building Enclosure Specialists are expert in building enclosure air barrier systems. We possess the experience and technical building science knowledge of design, performance, systems and construction relative to the building enclosure and are recognized leaders in their field of expertise. We approach every project as if it were our own. We analyze established best practices to ensure a successful outcome of an airtight enclosure for the general contractor and owner. Our principals stay with you every step of the way, and guide you through the process. Our track record for approved federal submittals on the first go-around is 100%. Our professional team has over 80+ years of experience. TMI® Team preparing to conduct a whole building air leakage test at a BJ’s Wholesale Club in Maryland. 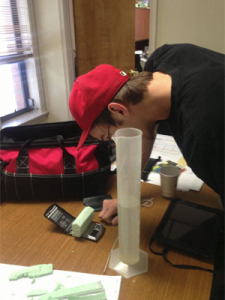 TMI® Technician conducting density testing on a spray-polyurethane foam (SPF) material. This test method uses a simple water-displacement technique to measure a material’s core density properties. TMI® technicians are using computer software to remotely control blower door fans during a whole building air tightness test. 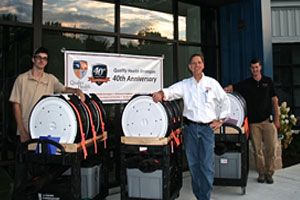 TMI® just starting the preparations for an air leakage test at a Quality Health Strategies building in Easton, Maryland. 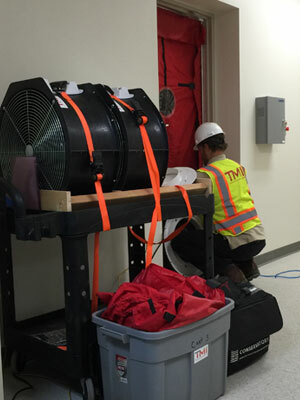 TMI® technician setting up a blower door fans to conduct a whole building airtightness test. 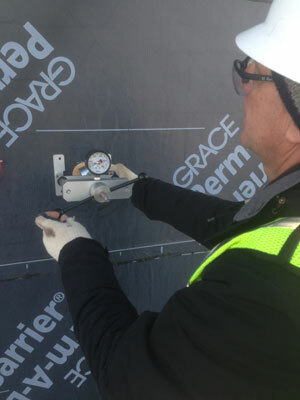 TMI® performing a pull-adhesion test on a self-adhered air barrier material. This test measures the bonding strength of the air barrier material to the substrate, as well as the cohesive strength of the material itself. TMI® is an independent third party testing agency and a Woman Owned Small Business (WOSB). ” Whiting Turner had a great experience with TMI on the Branch Health Clinic in Gulfport, MS. We were very uneasy with our air barrier quality due to it being installed under a different contractors supervision. The TMI team provided valuable insight and suggestions/solutions for our issues that clearly came from years of experience. 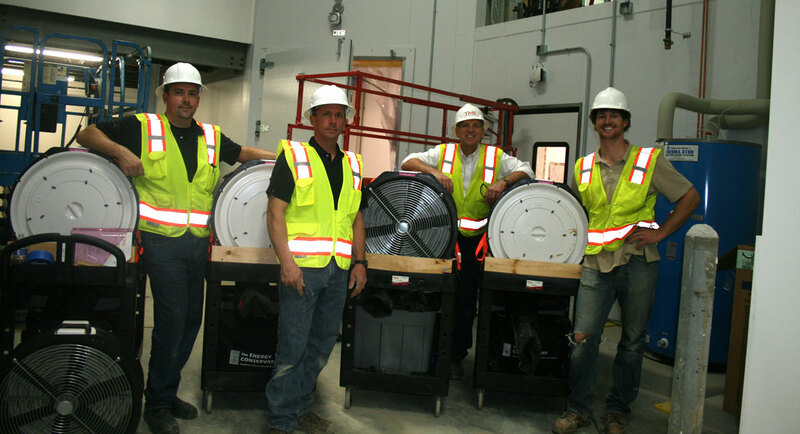 Their knowledge of the air barrier system, coupled with their superior organization and cooperation, were a key ingredient to successfully passing this phase of the project. The team was prompt, and worked diligently through the night completing the whole building air leakage test, infrared thermography and diagnostics so as to not hold up our construction schedule in any way. From expedited turnaround on paperwork and valued engineering prior to being on site, to the quality of workmanship and professionalism once on site, I was very impressed with the TMI team every step of the way. their recommendations for a continuous air barrier system. This involvement during the pre-planning and construction phase was instrumental to the success we experienced. Throughout the project, your team was professional, organized, timely, and able to react and respond to any changes or additional requests that the project needed. 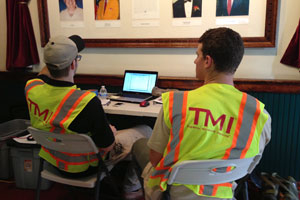 We appreciate that TMI consistently arrived as scheduled and even worked late into the night performing the whole building air leakage testing, infrared thermography and diagnostics so as not to hold up the construction schedule. “B.L. Harbert wants to thank you and your team for their exceptional work on the P-688 and P921 projects at Camp Lemonnier, Djibouti, Africa. Your team provided valuable insight into the project requirements, the air barrier system testing and their recommendations for a continuous air barrier system during testing of our construction. Their knowledge, professionalism and organization were beneﬁcial in getting these projects to pass the whole building testing phase. Your team arrived as planned and worked diligently with BLHI staff through multiple nights performing the whole building air leakage testing, infrared thermography and diagnostics so as not to hold up the construction schedule. We were impressed with their attention to detail and the timely turn around on all project reports and submittals. TMI® was requested to mobilize immediately to perform an Air Leakage Test ASTM E779 in St. Mary’s County, Maryland on a new Taco Bell restaurant. Mr. Coschignano, C.W. Hayes Construction Co.